IMG 18 72 7407 30 minutes from downtown. Siam Country Club Waterside Course designed by IMG, features gently sloping terrain, making it very different from the hillier Siam Country Club Old and Plantation Courses, spread out over 200 acres the golfer friendly course is of the same championship quality and 5-star experience as its other two big brothers next door. Environmental waste areas and straightforward designs are the emphasis of most holes at the Waterside Course, course design is strategic with several lakes and creeks in play. 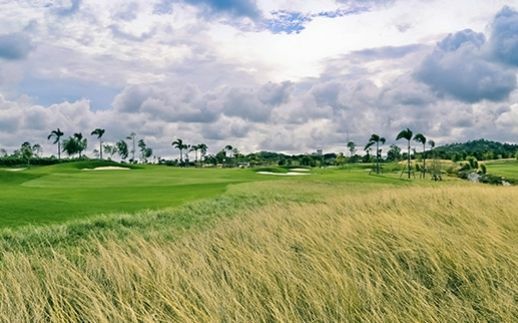 At over 7400 yards the back tees will challenge the best golfers, at the same time, other tees down to 5000 yards are available and offer enjoyment for all golfers, fairways are grassed with the latest variety of Paspalum grass while greens are a variety of Bermuda grass, many of the holes are framed by water while greens are basically flush with the fairways making most holes play very friendly. The Waterside clubhouse is of modern contemporary design and has all the facilities of a top golf club. The clubhouse features a 180 degree view of the surrounding valley, from the terrace golfers can see how the course, lakes, creeks and landscaping blend in with natural land formations. The well-stocked pro shop, excellent locker rooms and changing areas, and top quality restaurant serving both Thai and International cuisine add to overall special experience, combined with excellent staff, well trained caddies, and a first class operations staff to insure your day at Siam Waterside is truly memorable.